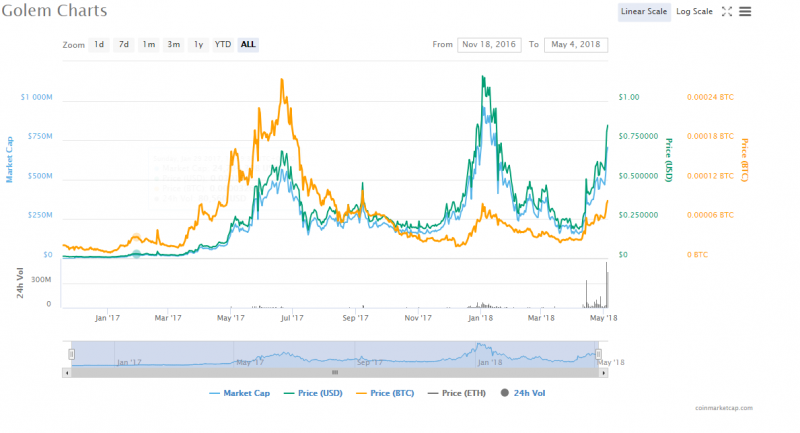 After taking a sharp drop between January and April this year, Golem (GNT) is quickly retracing back to its highs of December 2017. Very soon the crypto coin will get past $1.0. For the month of April alone, the crypto coin has risen by 2,797%. The prices have moved up from $0.00002911 USD as at 31st March to the current $0.814330 USD. This is a very large move for a period of one month. And with such a momentum, the coin is set to become one of the most valued crypto coin in the globe. Even the well ranked coins like Bitcoin are yet to make such a leap after their downfall in Q1, 2018. For crypto investors searching for a coin to invest in, Golem (GNT) is the coin to purchase. The coin is relatively new in the market but it offers a very promising opportunity of making money. But, where is such a momentum coming from? As an investor, you have to clearly understand whether the trend is worth risking. It is paramount that you do a thorough research before pouring your all time saving into a crypto coin. Between end of March and end of April this year, Golem (GNT) network has seen very effective improvements. These have played a very huge role in building the confidence of investors and also bringing the crypto coin to the limelight for the investors to recognize it. On 9th March, 2017, the cryptocurrency launched a campaign to reach out to the community, which was a great success. On 6th April, 2017, the audit of their smart contract by the name of Golem Brass Beta’s smart contract was completed. On 10th April, 2017, the audited Golem Brass Beta smart contract was launched on Ethereum mainnet. This availed the smart contract for potential users. We could clearly say that the combination of the effect of the above mentioned recent activities that have happened around Golem (GNT) with its features have helped propel it to great height. It uses Ethereum-based transaction system for payments between providers, requestors as well as software developers. The system (from application registry to transaction framework) gives every user the chance to come up, distribute and also monetize applications. Users are paid using Golem Network Tokens (GNT).